A friend once told me the funny story of how her sister, coming upon a jar of pickles I made last summer in her fridge, remarked in an amazed and slightly confrontational way that she was certain that one couldn't make pickles; they could only be bought. And the thing is, I think we tend to think that way about a lot of things. Especially things that take time, space and a lot of friendly bacteria. Things that we didn't necessarily see happening around the house growing up--things that mom was usually combating with bleach. Of course, these fermented foods (pickles, sauerkraut, yogurt, good air-dried charcuterie) are the product of decay and the growth of tiny microorganisms that we, in our modern age, have become afraid of. We pasteurize milk, only to add probiotic bacteria right back into it to sell as part of a new health craze. The bright tang of buttermilk in the old days was a result of raw cream developing a culture of bacteria, then being churned into butter. What was left was buttermilk, and the culture thickened the already low in fat liquid and gave it it's trademark tanginess. These days, the pasteurized milk is skimmed of fat, then a culture is added to it--not true buttermilk in many ways at all. BUT, we can make all of this stuff at home the old fashioned way ("old fashioned" usually meaning with more heart, soul and, importantly, flavor), and they turn out delicious and interesting. Wanna save money this summer? Get good produce from the farmer's market and pickle it. Or turn it into preserves. Keep it into the winter and have summer veggies and fruit all year round. And if you are someone who can't live without dairy products, like me (or my rotund cat, Akuma), make some yogurt at home. Now, as a rule, when I buy yogurt, I always get the good, thick Greek yogurt. Fage is a good brand, and one made somewhere in Illinois (whose name I forget) can usually be found in the smaller markets as well. This stuff isn't made for scarfing down on a lunch break with a box of Teddy Grahams and a Capri Sun--this something to dollop onto fresh fruit with a bit of honey or spread on toast. And you can make this thick yogurt at home as well. But I'm gonna be honest here--the people who make Greek yogurt can, at this point in my yogurt making career, do it much better than me, so I am going to stick to my very own style of "regular" yogurt--that is, much less thick, but every bit as tangy. I started a batch today, and it amazes me how this is something that is so quick and easy to do--one of those things that takes hours of waiting time and just a few minutes of actual active time. That's because all the real work is done by the bacteria we add to the milk to make it all happen. Inspired by an article in the New York Times by the venerable Harold McGee, author of On Food and Cooking (a must have if you want to delve deep into the science of food), I charged off to the store to get the ingredients to make yogurt. The trip home was much easier than one might think, because all I had to carry was milk and yogurt. I know, weird--buying yogurt to make yogurt. But as McGee put it in his article, if you aren't lucky enough to be given a yogurt culture starter by a friend, or resourceful enough to find a place that sells the culture in raw form, your best bet is to buy some yogurt with live cultures and use that as a starter. And the cheaper the better. My thinking is that fresh bacteria is added to each batch of the big industrial brands, as opposed to the smaller, more "boutique" yogurts being cultivated with more interesting but perhaps less potent strains. And sure, the big brands are full of stabilizers and the like, but for the small amount used, these get diluted over time (after all, we can use our new batch of yogurt to start the next one). This in mind, I still decided to buy organic yogurt to go with my organic milk (milk is something I don't compromise on too much, usually buying small farm and organic). The equipment is simple. The process is simpler. 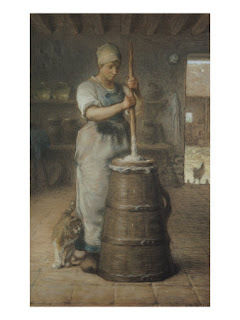 I remember, as a boy, seeing a yogurt machine around the house--as I recall it was a tray of eight or so little cups, into which milk and culture would go and be covered, the whole contraption then plugged in and incubated for a time to convert the milk into yogurt. Thus, until recently, I always viewed yogurt as a big pain to make--lots of specialized equipment and all that. But McGee's article opened my eyes--all I needed was a pan to heat milk and a container to keep the yogurt in. An optional thermometer helps, but isn't absolutely necessary, as I'm sure the ancient Greeks didn't have instant-read thermometers. Then, the milk is allowed to cool to roughly 120°F, which is just very warm to the touch. Any chef who has been through the nightmare of an annual health inspection can tell you that in order to prevent the growth of bacteria, temperatures must be below 40°F or above 140°F. And if this chef likes delicious food, they can also tell you that sometimes, keeping food between 40°F and 140°F is crucial to development of certain beneficial bacterias as well. So, seeing how I'm not in a restaurant anymore, and seeing how the health department can't shut down Food on the Dole (though something tells me that the Daley Empire could find a way), I will say that it is crucial to keep the temperature of the milk/yogurt around 100°F to 120°F for the duration of the process. Much hotter, and the bacteria will die; much cooler and it would take the bacteria forever to get the job done of reproducing and turning the milk into yogurt. Basically, you want to recreate a really hot day on Clark Street after a Cubs game. But with more savory specimens involved. Once the milk is cooled to the desired 120°F, we take a cup or so of it out and stir that with a couple of tablespoons of our plain yogurt, full of live and active cultures. We mix this all back into the rest of the milk and pour it all into an appropriately sized container, cover loosely and put in a warm spot to maintain the temperature. If it's cool in your kitchen, wrap the container in several kitchen towels and put it in the oven (which hasn't been turned on, of course). Me, I ran my microwave with a couple small saucers (to retain heat) in it for a few minutes, then put the wrapped container inside and closed the door. The residual heat left inside the microwave ensured the warmth of the mixture, and I've gotta say, it worked really well. Now I have a second use for my microwave (the first being melting butter). The mixture stays inside for at least the health department approved maximum 4 hours (though I found leaving it for about 12 hours or even overnight works even better), then it gets put in the fridge to cool and set a bit more. And what comes out in the morning is like magic. Smooth, creamy, rich and tart as can be. Delicious with fruit, with honey, in pancakes and waffles, drizzled on steel cut oats. And way cheaper than buying yogurt. Plus, a bit of this batch can be saved and put into the next as a starter, or even given to a friend to start their family of yogurt. And it's full of good bacteria for the digestive system. All the more reason for that next ham sandwich at The Hop Leaf--lactobacillus delbrueckii subspecies bulgaricus has gotta eat too, hasn't it? The Chicago 10, or, A Potluck Really Isn't Just About Food, Is It? If you are still reading this and I haven't been banished from Chicago, let's move on. Lisa also brought Brussels sprouts, deliciously roasted rather than grilled with the hot dogs due to the whole Brussels sprouts falling through the grill conundrum. We all discussed how Brussels sprouts (note the 's' on the end of Brussels--so often left off) get a bad rap, much like Lima beans and cabbage. Cooked well, all of these things can be delicious, and these ones, soft and tender, certainly were. Anne and Davis arrived bearing a terrific kale salad, adding a much needed element of fibrous greens to the table. And it was really, really good. Diced carrots and plenty of garlic made it into the bowl, and a rich, flavorful dressing of what I recall to be Balsamic vinegar and olive oil really made the salad happen. Kale is so amazingly good for the body, and I've had it cooked so much, but I can't remember having it raw. It worked splendidly. And the best part of a salad like this, as Davis pointed out, was that it can be dressed, and whatever is leftover can sit, dressed, in the fridge for a few days, and still be really good. Because of kale's thickness and sturdiness, it'll hold up to that, whereas a salad made of most anything else will wilt within a few hours, and turn into a brown soggy mess. In fact, I just finished what I kept last night, 24 hours later, and it was just as good as the night before. Jenn brought a great quiche, made with the all - important handmade crust she rolled out herself. Leeks and eggs made the quiche good; the ham inside spread it's smokiness throughout and took the quiche to another level--not just another bland, eggy quiche--this one was full of flavor, and with a crust you want to eat completely. She followed this up with the lightest butterscotch meringue cookies ever, so airy and delicate, crunching into powder when eaten. Made with butterscotch schnapps that she said sort of just showed up at her house, kicking off a discussion of those mysterious liquors that no one ever really buys, but they just end up in the cabinet after parties. Nick and Andrea brought the spice to the party--a pot full of pork green chile, made with tomatillos and roasted peppers. They came bearing lots of accessories as well: tortillas and a tortilla container to keep them warm, sour cream, cilantro and limes. The chile added a welcome sharpness to all of the rich foods we'd been enjoying so far, and took our taste buds up a bit, asking to be quenched with the beer and wine everyone brought. They even left some behind for me--I ate it this morning, simmering some torn corn tortillas and a couple of cracked eggs in it for breakfast. Julia was our next arrival, bringing a big bowl of quinoa, the wonder grain, bursting with bits of salmon, tomatoes and other veggies. A nice cool down from the hot chile, the quinoa was full of flavor--something that happens far too infrequently with quinoa. Despite the grain having a distinct taste of it's own, I've had it too much where seasoning issues make it just plain boring. This had big flavor, with distinct bits of salmon tucked into flavorful quinoa with vegetables that were so welcome to our heavy potluck. Aside from the kale salad, this was definitely the healthiest complete item brought that night. I marinated some Capriole Chevre in olive oil, red wine vinegar and garlic, and made a lasagna bolognese, complete with beef from Iowa braised in the homemade sauce, which was finished with milk from Saturday's Green City Market. We hand-rolled spinach pasta and baked the lasagna, pulling it from the oven just as guests arrived. Jill rounded out Jenn's dessert meringues with a big batch of Scotcheroos--which involved rice krispies, peanut butter, chocolate and butterscotch chips. So dense and rich, so textured and crispy, so very delicious, she made it from a recipe from her grandmother. A perfect way to end a potluck. But the thing is, the potluck didn't end there. Most guests stayed, and we sat around the table, people who just met chatting away like old friends, drinking wine and beer and just enjoying each other's company. This was special, and this was the goal of the evening. The food brought everyone together; the spirit of the event kept everyone there. Some had to leave early (it was a Sunday night), but really, each person who came through my door that evening left a big impression on me, and I hope this is something that we can continue in the future. The response was pretty positive to the idea of more potlucks, and if any of you out there would like to join in, please let me know. After all, there's now proof that something like this actually can happen in the city, in this day and age, thanks to the brave initial ten that took the plunge that rainy night and made it happen. My community is expanded now, and that's a pretty special thing. 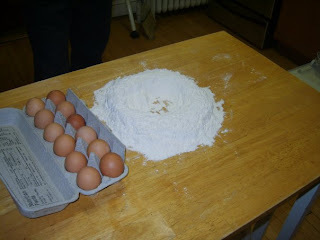 Not too long ago a good friend invited me to his home in order to teach him how to make fresh pasta. He’s a cook, and a good one at that, but somewhere along the line I’d convinced him that I knew what I was talking about when it comes to fresh pasta, which may or may not be true. Most importantly, though, it was to pass on one of the truly great culinary traditions--the kind of gift that costs nothing, but is worth everything to someone who puts it into practice. I was given this gift by a wonderful woman; the daughter of Italian immigrants who told stories of her mother’s weekly pasta making: every Sunday, she would make tons of pasta, using every available space in their New York apartment to hang it to dry. 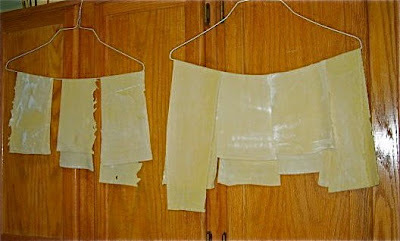 Hanging across banisters, laid over beds--the apartment was filled with the wonderful golden sheets, and what wasn’t dried was used immediately to make ravioli, and it was ravioli that I was being taught as she told me these stories from her childhood. Most amazingly, this pasta was hand-made from start to finish. 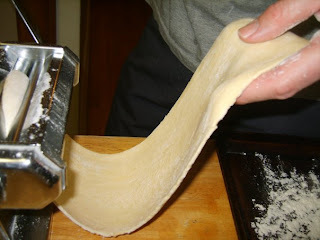 By which I mean to say it was done without a pasta rolling machine--she did everything on a wonderfully ancient wooden block, rolling the dough out by hand using a rolling pin that had seen some hundreds of batches in its day. 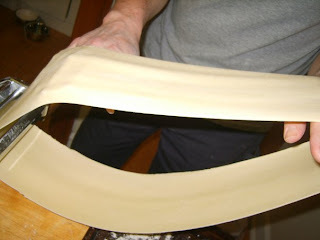 If you’ve ever tried to make pasta this way, you’ll understand the amazing strength, finesse and patience this method takes, rolling ... resting ... rolling ... and ... resting as the desired gluten that gives really good pasta such a toothsome quality takes its time relaxing and becoming more workable. It’s like it it's alive--push down a really well worked piece of dough and watch it bounce back into shape--and now imagine working that dough down to pasta’s fine thinness. Thus the patience, thus the finesse, and thus the strength...but don’t all great things require this? Like lifting a hugely heavy jet black cast iron pan to the stove, only to let it sit on a flame as the clock ticks by in order for it to heat up properly. Or growing tomatoes. Or raising a pig. Learning from her hands passing this ancient knowledge to mine, we made ravioli after ravioli, each one bigger than the last, in that (perhaps) unconscious way of getting the job done by making the product disappear faster. She, of course, pointed out this flaw in my and my ravioli partner’s (who happened to be her daughter) technique as she completed her own near-perfect set. As a first timer, I was excused. Unfortunately, my partner was banished to the next room to watch the Red Sox game with her father, his skills reserved for the more work horse tasks, like stuffing the artichokes (another great story for another time). So, this was one of the single greatest culinary gifts ever given to me, and I love to pass it on anytime I can. And good things have come of it. At a demonstration I gave at the Chicago Botanic Gardens, a woman in the crowd approached me afterward, sharing with me the very similar story of her mother’s pasta making while she was a child. It’s great to see someone reach way back into memory and catch that wisp of nostalgia, and food is one of the great instigators of this. My gift to the new daughter of one of my best friends (a friend, incidentally, who once defended, to our chef, my decision to hand roll ravioli for an evening's dinner service special) is the promise to pass pasta making on to her when she’s old enough. 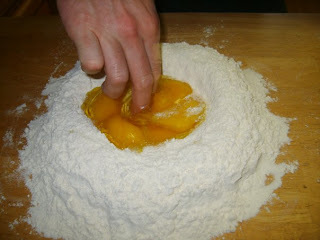 And it was in this spirit that I went to teach my friend in Chicago how to make fresh pasta when he asked. Well, that, and the fact that his partner always opens up bottles of great wine when I’m over there. 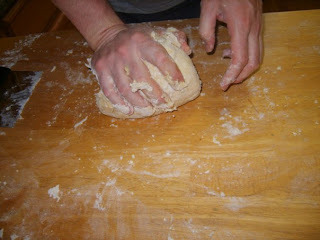 So to that end, I’ve got a few pictures of the process: flour on a board, well in the flour, eggs in the well, stir with fingers, knead, rest, roll and cut; much like bread, pasta isn’t so much something that can be passed on in a recipe. It’s got to be passed on hand-to-hand; it has to be touched, and it has to be felt. I’m sure many of you know the process; if anyone wants to learn it, let me know. After all, I’m on the dole, and I’ve got spare time. A good friend of mine is responsible for two things. One is convincing me, one wine soaked evening, to start Food on the Dole. Secondly, he's the main force behind creating the cocktails at the place he works. Which happens to be the place I used to work. Which happens to mean that he and I would often spend time discussing, creating, and, most importantly, tasting these cocktails and the food I'd be making for the same specials menu, which was a ton of fun, and one of the more creative and pleasurable duties of cheffing. Obviously, this needs to continue despite my absence, so he decided to restock his liquor cabinet via the Cocktail Party method (always a good route to take, much like the wine and beer-stocking event that usually masquerades as a House Warming Party). Which meant a handful of us gathering at his place for experimentation and pizza from the unfortunately named Pizzeria Aroma right by the Berwyn Red Line stop (which, by the way, was really, really good, despite the crust leaving room for improvement, but someone always has a problem with this crust or that crust on every pizza, don't you think?). I brought a sack full of limes and lemons and mint along with my trusty, beloved citrus juicer, and he kindly bought all the liquor. We decided to focus on Rye and Gin, mainly because we both like these spirits, and I get soap-box-ranty about the (dis)merits of Vodka anytime it enters the discussion, room, or cocktail. He bought a bottle of Templeton Rye, lovingly produced in Iowa (and interestingly only available in Iowa and Illinois--laws, you know? ), and a bottle of Junipero Gin, made by the Anchor Distilling Company in San Francisco (yes, the same Anchor that makes that beer my dad likes). 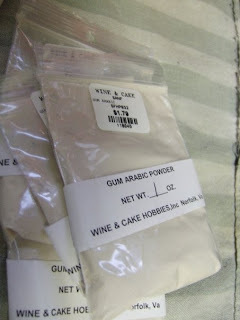 He made some Grenadine using a pomegranate juice he reduced with some sugar, and a syrup for sweetening using some gum arabic he had to smuggle out of the post office due to its powder-in-a-little-plastic-bag appearance. We had the mint, limes, lemons, Angostura bitters, and this weird coconut juice with chunks of coconut suspended in the strangely thick, clear liquid. Oh, and eggs, too. We proceeded. I had a few in mind, including an Aviation (gin, lemon juice and Maraschino liqueur--and no, that's not the red corn syrup water left in the jar of cherries you get in the corner store), a Sazerac (Pernod, sugar, water, bitters, and rye), a Ward Eight (whiskey, lemon juice, and grenadine) and a Sidecar (lemon juice, triple sec and brandy). In the interest of keeping things simple and using what was available (gin and rye), we stuck to the Ward Eight, a tasty blend of a Floradora and a Flip, and an unnamed concoction using the weird coconut juice, lime juice, grenadine and acai liqueur (you know, to make it healthy). The Ward Eight allegedly originated in Boston back in 1898 in a story involving politicians, almost certainly of the corrupt kind (pretty standard really, but probably with better haircuts and speaking skills), in the great restaurant Locke-Ober, which is still standing, and standing strong after a big renovation by the owners, including the chef Lydia Shire. Our version was really, really good--one of those super dangerous drinks that you could drink all day long in the summer, say, if you were unemployed and had a good thermos and lived right by Lake Michigan. We added orange juice to ours, and made it with that Templeton Rye. The soda water stretches and thins it outa touch, giving it the aforementioned dangerously drinkable quality, and we added a sprig of mint to it for some added freshness. Ours was served in a highball glass due to the soda water stretch, and well, at this point, there are probably some traditionalists in Boston who wouldn't call it a Ward Eight anymore (plus, we blew it and didn't bring the traditional mini-Massachusetts flag that the drink usually gets garnished with). Regardless, it was good. Moving on, the next drink, as mentioned, took off from a Floradora recipe, usually framboise/raspberry liquer, lime juice, gin and ginger ale. 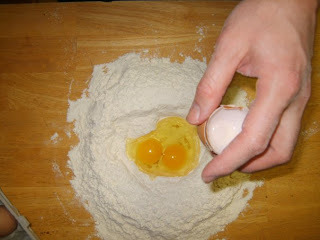 But we decided midway through making it to explore flips as well, which usually involve an egg and some serious shaking. 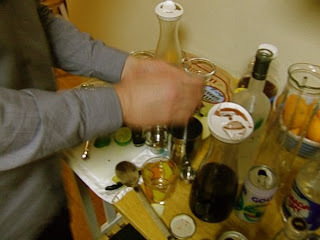 For our drink we subsituted the homemade grenadine for the framboise liqueur, and we used that good Anchor Junipero Gin. We left the ginger ale out, mostly because we didn't have any, and we added an egg white (leaving the yolk out for our maiden journey into the world of flips) and shook all the ingredients with a bit of ice to help aerate the egg white. I was reading about the flip, and found a great story regarding another great Boston restaurant, No. 9 Park, that describes how, no matter how busy the bar is when the writer goes in and orders a rye flip, the bartender will shake the drink for a full 5 minutes in order to give it proper aeration. Anyone who has ever worked behind a bar or kitchen line on a busy Saturday night can fully appreciate the significance of this dedication to quality. I set our timer and we shook, shook, shook the flip; taking turns freezing our hands on the metal shaker until the 5 minutes were up, and the drink came out amazingly light and creamy tasting, quite delicious and interesting. 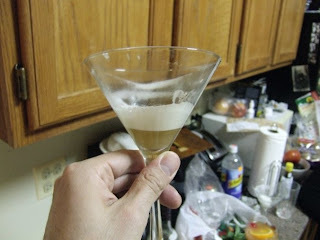 The egg white really added a bit of body and a delicious, rich flavor to the drink, kind of like a light egg nog. The final drink of many was made to utilize the coconut juice. We added a good deal of lime juice to it, and boozed it up with the acai liquer. The drink was refreshing and light, bright and cool. A good summery drink. And something someone who works in a bar could sell to people as a healthy cocktail, hopefully with the understanding that there's nothing healthy about it at all. But you never know these days. After all, the Atkins Diet was viewed as a healthy way to eat for a long time. 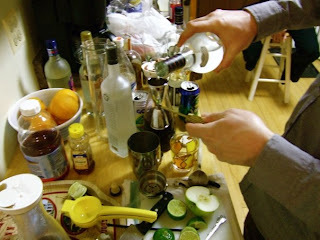 Since that night, many more cocktails have been made. I've put my juicer to good work, stripped my teeth of much of their enamel, and experimented a lot. The main thing is, I think, to explore and respect these old drinks, without taking them (or ourselves) too seriously. Because drinks are meant to be fun and delicious, not stogy and contrived. And you can make really nice ones in your home--even though we're very lucky to be at a point in time when some really great bars are putting the necessary work and respect into the cocktail, it doesn't always have to happen in an exclusive bar with velvet seats and waiting lists. And you don't have to be a crooked politician to enjoy one, either. So...What Happens When I Find a Job? I realize it's been a week or so since my last post. Not to fear; I'm still on the dole, but picking up a few gigs here and there. That said, I wanted to share a great article that came out in the Chicago Sun Times this week (there are two parts, as well as a bunch of recipes that, despite my post a few weeks ago, I wrote). It's definitely relevant to the times (I just saw an article this morning claiming the fact that 2 million jobs have been lost so far in 2009--yipes! ), and it documents the fact that regardless of the rough waters, we can still come together over food and drink and have a terrific time, whether we're toasting champagne or making bread together. It was an absolute pleasure helping out with the story, and, as always should happen when cooking and eating, I learned some things along the way. Meanwhile, remember when I said that there isn't any such thing as a really bad pizza? 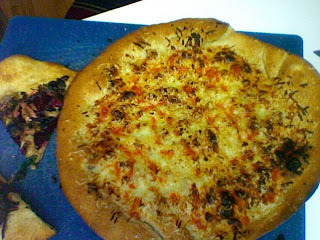 I mean some are not good, but it's still pizza, after all...well, to make it at home is super, super cheap, and I made a couple last week. I made about a pound of a whole wheat dough with a bit of honey in it--real quick and easy--it rose over a couple of hours and then I rolled it out into two pizza crusts. 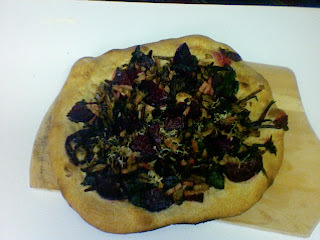 One was topped with roasted beets (foil, oil, salt and pepper and low and slow in the oven) and their sauteed greens, caramelized onions, and chopped up bits of marinated eggplant from the above story (both pizzas were brushed with the oil this eggplant marinated in). Shaved a bit of this great clothbound cheddar from Vermont I somehow ended up with after a recent event right on top. The other one got leftover pork rillettes from the above story, some of that great cheddar, some swiss cheese I had laying around, some mozz (not to be confused with Moz, who I'll be seeing Saturday), and a drizzle of Sriracha (why not?). Baked quick in a hot, hot oven on a terra cotta plant pot bottom did the trick and all was delicious, served with some honey for the whole wheat crust edges. And, as promised way back, more soon on a great cocktail experimenting party I attended recently...thank you for your patience!